As part of the research project carried out by Professor Donald Green of Yale University, the following hypothesis was tested: The study of Eshcolot strategies and thinking concepts improves children’s “language of thinking.” At the start of the process, the children’s language of thinking was measured by using a list of “thinking-concepts”. The children were required to choose the most suitable definition for concepts such as: decision, goal, planning, problem, process. The research group – deliberately composed of children whose scholastic abilities had been assessed as weak – took part in a weekly lesson of the Eshcolot Method for a three-month period. For an identical period, the control group was exposed to the same thinking games but did not participate in a reflective post-game discussion, which is an essential part of the Eshcolot Method. 1. The learning of Eshcolot strategic and thinking concepts enriches and elaborates children’s language of thinking and considerably enhances their language skills. 2. The control-group children, whose participation was limited to the playing of thinking games, tended to improve their language of thinking although to a lesser extent than those children who took part in the Eshcolot post-game reflective discussion. 3. The Eshcolot Method is especially effective among children with weak scholastic achievements. Professor Donald Green of Yale University metaphorically referred to the Eshcolot Method as one that uncovers “diamonds in the rough” and then polishes them. Professor Donald Green (Yale University, USA). Findings of the studies to date demonstrate a strong positive influence exerted by the Eshcolot Method on children’s scholastic achievements in general, and particularly in the fields of mathematical and language skills. Additional research projects are planned for the coming years in an effort to further evaluate and augment the Eshcolot Method. The efficacy of the Eshcolot Method has been put to the test in a number of comparative research projects carried out in conjunction with senior researchers, most notably with Professor Donald Green of Yale University. The research verifies that the Eshcolot Method significantly improves pupils’ thinking abilities and life skills. – In one of these research projects, the following hypothesis was tested: Children can be taught abstract strategic thinking by learning meta-cognitive models and by being exposed to the applications of these models in thinking games and in real life situations. In order to test this assumption, a field study was conducted in which children aged 8-12, from diverse socio-economic backgrounds, took part. – In the first stage, all the children were presented with the computerized version of the game “Rush Hour.” This advanced version monitors children’s performance and progress and then collates it all into a database. 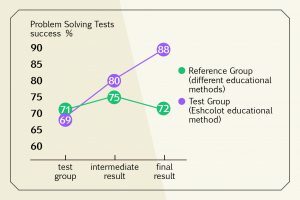 – In the second stage, children in the research group were taught abstract models for problem-solving, and their analogies to real-life situations. Subsequently they were shown how these models could be applied directly in the games. The children in the control group simply participated freely in game-playing sessions. – In the third stage, all the children were taught a new game, “Lunar Lockout.” Both groups received identical instruction. performance levels in relation to their counterparts in the control group, even though the latter were allocated more time in their game-playing sessions. The remarkable fact is that even in Stage Three, the research group achieved notably higher results. In fact, the disparity between the two groups actually increased between Stages Two and Three. 1.The learning of Eshcolot problem-solving models significantly improves children’s strategic thinking skills. 2.The children who learned Eshcolot abstract models succeeded in transferring the knowledge acquired to new fields, and the improvement in these new fields was even greater than in the original game.